With Brentford preparing to take on Derby County this weekend, Dean Smith was in buoyant mood at yesterday’s press conference. There was more from the club’s ‘phone a fan’ scheme where Alan Judge was in the hotseat and, of course, European football has been at the forefront of our attention with Manchester United, amongst others, making the news. But I wanted to start with a few quotes from Dean’s press conference in regards to the Derby game. The Bees recent form of nil points, no goals, 7(seven) against from the games with Brighton and Sheffield Wednesday isn’t great. But for those who think we are in free fall, spare a thought for our opponents. A change in manager wasn’t enough to reverse the fortunes of a team who have lost four and drawn four from their last eight league games. It is a worrying run of form for a side that have come ‘so close’ in the last two seasons and would be looking to go one better this time around. That they still remain in the play-off zone is testament to their early season form and the Rams will, no doubt, be bang up for three points this weekend with Birmingham now breathing down their necks. The one positive I guess is that at least our head coach has acknowledged this. He could hardly not, to be fair. “The manner of the goals we conceded was not good” would seem to be somewhat of an understatement but, if we can stop shipping them quite so readily, that’ll be half the job done. Then we just need to find our way at the other end …..
Next up, yesterday’s European football. Cup fever had this corner of West London gripped last night with the draw for the Gibraltar Rock Cup. Glacis United face a nightmare tie with all-conquering Lincoln Red Imps. They, of course, reached the second qualifying round of this season’s Champions League, before narrowly missing out to Danish side FCM . And given our current fascination with all things Manchester United, their Gibraltarian equivalents (in name, at least) the rebranded Manchester 62 face College 1975. Ties to be played the week of March 16 and you can see the full draw below, c/o @GibFootballTalk. On the subject of Manchester United, it would be remiss of me not to mention the Europa League. If you think Derby County are on a bad run of form, Gary Neville hasn’t exactly had things easy since taking over as manager of Valencia . How that has changed! After getting his first league win at the weekend, last night he saw his team become the first to score five goals in the opening half of a Europa League game. Agonisingly, Valencia fell one short of a 7(seven) -0 bracketing as they eventually ran out 6-0 winners over Rapid Vienna. And finally, Brentford’s excellent ‘phone a fan’ scheme continued yesterday with Alan Judge manning the switchboard and the club having to convince another fan that yes, our man of the moment really had just called them up. As ever, the background detail on these stories is what really makes them. The motivational pep talks aren’t just confined to our press conference, if the white board in the ticket office is to be believed. And relax. After a frenetic period of speculation, match action and the eventual appointment of Dean Smith as the new Brentford Head Coach, supporters can finally catch their breath. Fans tuning in to last night’s Southampton – Liverpool Capital One Cup action were reminded of a Griffin Park great whilst those amongst us with a kit obsession have a tough choice to make later today. But I’m going to start, briefly, at St. Marys – simply because of the one sided scoreline that saw Liverpool run out with an astounding 1-6 victory. Even more so given the speed with which Southampton opened proceedings – Sadio Mane grabbing the opening goal with less than 40 seconds on the clock to give the home side an early lead. For me this was significant for several reasons – not least the ongoing quest for brackets. Liverpool grabbing their sixth in the 86th minute left us with that delicious possibility of the videprinter ticking over to 7(seven). Sadly, it wasn’t to be but that period is a moment that always adds an extra frisson of excitement to any game for neutrals (or is that just me?). For us Bees, there was additional significance in this being The Saints heaviest home defeat since going down 6-0 to Brentford back in March 1959. That, a game where the legendary Jim Towers did his very best to single-handedly inflict brackets as he bagged four goals. Say what you want about Liverpool, but they looked good doing it last night. The black ‘third’ shirt is another trait they share with Brentford as the Bolton game saw our equivalent get another airing on Monday. I have to be honest that my own initial enthusiasm for our blue ‘away’ kit has worn off a tad but this new one is a stunner. There’s none of the superfluous trim that has blighted previous efforts – specifically our last attempt back in 2009-10 where we had more additional gold than Mr. T.
This is just simple black and white with a wonderful hint of silver. And I want one. Badly. Indeed, from talking to Brentford fans it seems I’m not alone in this respect and so can only imagine a series of hastily scribbled notes are being written to Father Christmas. But equally, much though we love it, fans are also aware that this shirt is not on general sale. The only way to get one as things stand (aside from being Sam Saunders) is via the charity auctions in aid of the Royal British Legion which end today. This really is a wonderful way to raise money for a great cause although, regrettably, the current prices are probably a leap too far for yours truly. Nice though these are, Mrs. Bruzon would probably have my guts if I came home for Christmas with Sam’s match worn shirt for me and no budget left for anything beyond some magic beans for her. Given the chances of getting one through general release are as likely as seeing a bracketing, perhaps the marketing chaps or Kitman Bob might have next season’s ‘away’ shirt under their noses without even realising it. With Brentford fans adjusting to the news about Mark Warburton ahead of Saturday’s game against Bournemouth, the saga has been somewhat distracting for anybody interested in matters outside TW8. On the plus side, the interminable fixation with Eastenders has, largely, drifted past despite my twitter timeline being flooded with oblique reference to Ian Beale. The downside has been missing out on canine fun at Bristol Rovers, Liverpool (almost) doing a Trotta and a transfer story involving the one time scourge of Bournemouth, Mike Grella. 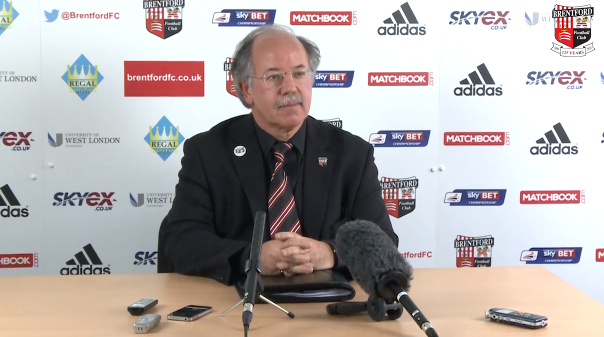 Rounding off the news about Warbs, on Thursday Chairman Cliff Crown spoke to the press from the Brentford Media Centre. I have to be honest, this was something I didn’t even realised existed and seemed less SSNHQ, more a desk covered in discarded telephones placed in front of an advertising backdrop. A frank admission from Cliff and if you want to see the whole interview, it is on the club’s YouTube channel, below. Moving away from the situation surrounding the management, you might not have noticed the news coming from across the Atlantic this week. The New York Red Bulls may have lost the services of Thierry Henry but they have replaced him with former Brentford hit man, Mike Grella. The date 8th November 2011. The place Griffin Park. Brentford lined up against Bournemouth for a JPT semi and ended up just one shy of brackets. Grella smashed four goals as the hapless Cherries were routed 6-0 and the Bees spent the final 11 minutes, including stoppages, chasing a 7th(seventh). With many Bournemouth fans living in London, and even closer to TW8, it is a result that still gets mentioned on a regular basis. They may have spent much of this season TOTL but I’ll never forget the night that the gorilla went ape. Put down this article and go immediately to twitter (then come back). 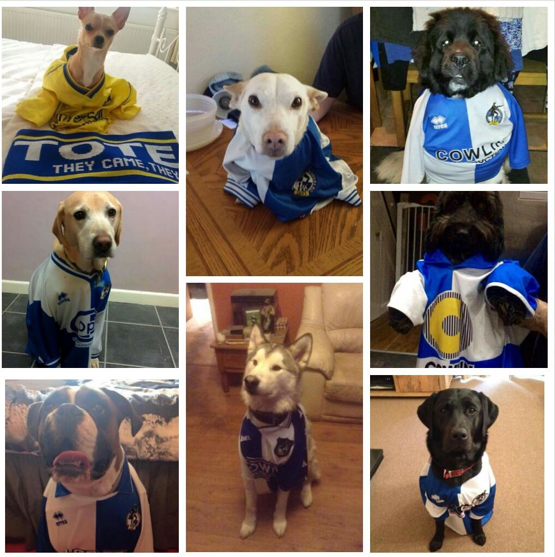 Type in the hashtag – #dogsinbristolroversshirts. I don’t know what has sparked the craze but you get exactly what you ask for. Dogs. Wearing Bristol Rovers shirts. I didn’t even realise that many Bristol Rovers shirts existed although this sort of dog related couture isn’t a new thing, with precedent having been set by Brentford. 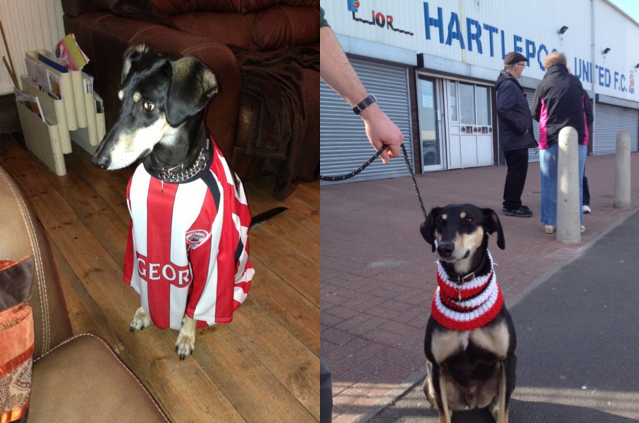 Woofy McWoofington has long been known for his love of the ‘St.George’ home shirt, whilst even turned up in a Bees scarf for the Hartlepool game (the one before ‘that penalty’). That said, whilst Woofy may have worn a shirt first, Rovers have picked up the stick and run with it. The internet is flooded with them. And a great thing it is too. Finally, talking of ‘that penalty’ , don’t people watch sports news? Perhaps the incident against Doncaster Rovers didn’t get enough airplay (that’ll be it). However, watching the Liverpool – Besiktas game last night I couldn’t help feel a sense of déjà vu, watching Mario Balotelli and Jordan Henderson arguing in front of the home fans over who was going to take a late spot kick with the scores locked at 0-0. The enigmatic Italian eventually got the honours, the goal and a rebuke from Steven Gerrard sitting in the ITV press box. Good luck to them. We’ve grown from our own incident in a fashion that I could never have believed possible from the distraught feeling that afternoon. Whilst it is far too early to be talking about playing the likes of Liverpool, it is incredible to think that three more points tomorrow could take us one step closer to that craziness. Let’s put the week behind us, get behind the manager and go for it.